Flew from Nashville to Los Angeles to Shanghai to Phuket, Thailand. We slept late but woke to the sounds of “long tail boats” plying the waters around us. 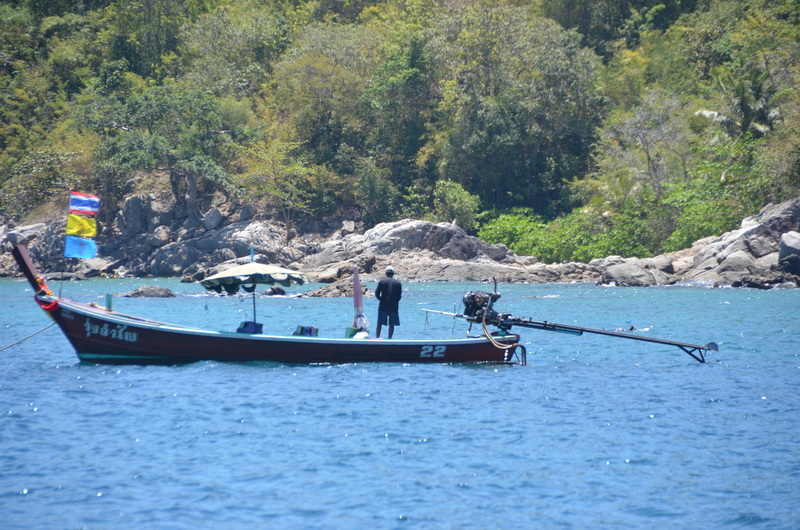 Long tail boats are the boat of choice of Thai fishermen. They have a dramatic sheer line that sweeps up into an impressive prow that cuts through waves, but the name comes from their method of propulsion. Automobile engines are mounted in the stern but not down low in the hull. Instead, they are mounted above the freeboard and have long drive shafts that reach into the water about 10 feet behind the boat. They look something like a giant weedeater with a propeller on the end. The helmsman steers the boat by swiveling the apparatus left or right, so propulsion and steerage are combined in one piece of equipment. ‘Sup? Koh Sup. 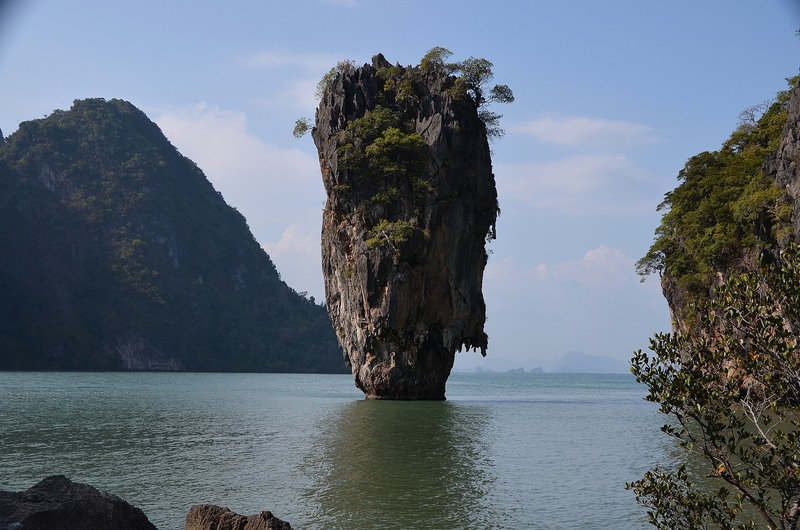 Koh Sup is two monolithic stones that rise 35 meters straight up out of the water. They lay in our path to Koh Yao Yai, which was fortunate because we didn’t have to alter course to get a good look at them. When they were still far in the distance Diana referred to them as “bunny ears” sticking out of the water. Closer, they were even more interesting with greenery growing on them in places, and even a few trees. The relentless tide had whittled away at their bases so that they were smaller at the water line than higher up. As we neared Koh Yao Yai we were approached by a long tail boat with a Thai fisherman and his wife. They had caught a fresh bucket of giant prawn. He circled behind us and after we slacked our sails, he pulled up beside us with a big grin and his wife holding up a string of prawn. His broken English was only a little better than my Thai, but we conducted business and closed the deal with me tossing him a Coca-Cola, one of the few English words he could almost say. After a hearty breakfast on board we set sail for Koh Phi Phi Don. First, a word about pronunciation: In Thai, Phi Phi is pronounced more like pee pee than fee fee, but the lips don’t quite touch to form a plosive as in English. So it is a “soft p” with more breath than the English “p”, as indicated by the “h” in Phi Phi. Try it a few hundred times and you’ll get it right. Koh Phi Phi is a huge tourist center. Although there are several beautiful beaches and bays around the island, most of the development and activity is at Tonsai Bay on the southern end of the island. What I had expected to be Paradise was “Paradise Squandered.” The town was a cross between Wang Fu Jing street in Beijing and Hee Haw Village in Gatlinburg. But at the far west end of the beach we found the bay’s only redeeming feature: a small group of bungalows with a tiny restaurant on the beach. The restaurant was an open-air wooden deck raised about one foot above the sandy beach. A charming Thai waitress brought us a very nice dinner and the password to Mama Beach’s wifi! We raised anchor and hustled out of Tonsai Bay at first light. Our objective was to be the first boat into Maya Bay on Koh Phi Phi Le, the smaller neighbor to the south of Koh Phi Phi Don. This is the island where Leonardo DiCaprio’s movie “The Beach” was made. The island rises straight up from the water to a height of 375 meters. 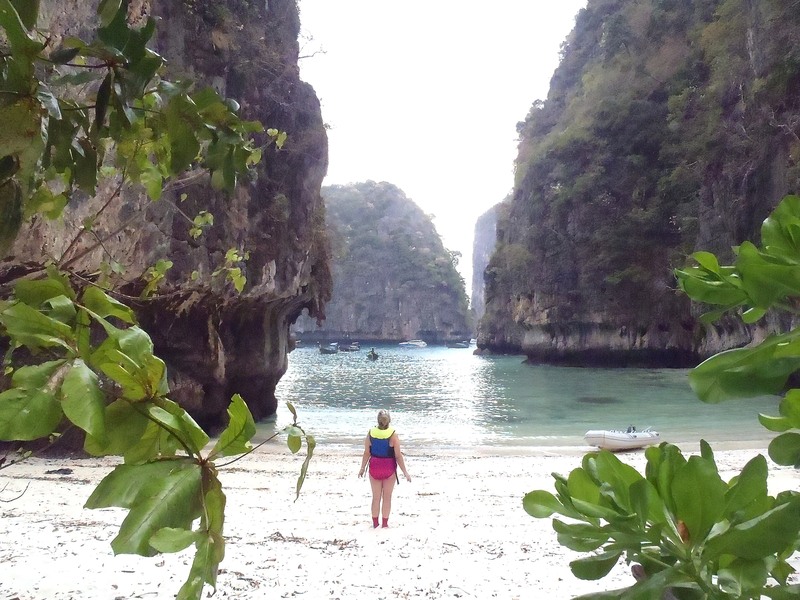 The sheer limestone cliffs are an imposing sight from miles away, but when you enter Maya Bay through an opening in these towering cliffs, you see a gorgeous spread of pure white beach. The sand is so fine that it’s hard to discern individual grains of sand. As the day progressed the beach was lined with speed boats and long-tails bringing tourists, but there was plenty of beach for everyone. After walking the beach and swimming, we found a trail through the tropical forest. The trail itself was a delight–cool, pleasant, and beautiful under the palm fronds. It ended on the other side of the island where a narrow channel of water separated the main island from a free standing tower of rock. 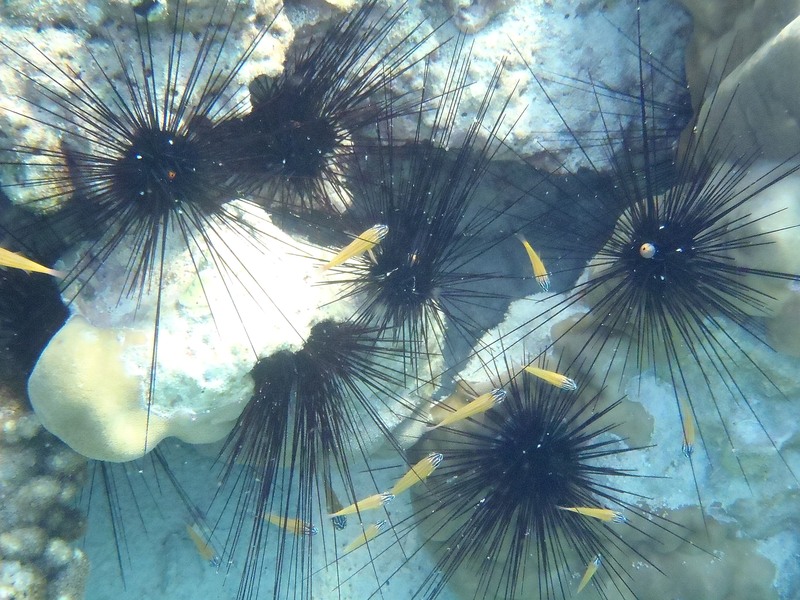 A few long-tails brought tourists to snorkel there. Later in the afternoon we motored around the island to visit this area in our dinghy. As if this place wasn’t special enough, we found a small hidden beach in a deep narrow canyon–we were the only feet on this beach. 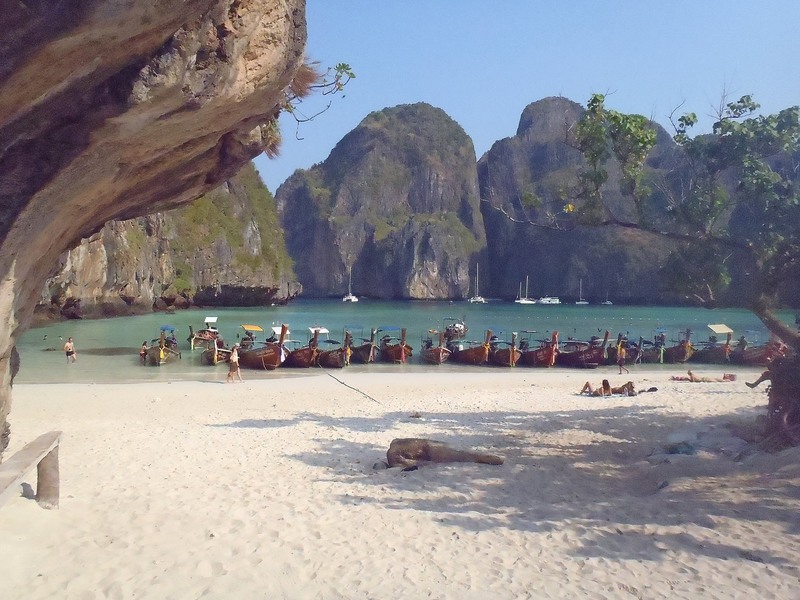 If you can tolerate the strange movie, watching “The Beach” will reveal the marvelous beauty of this Jewel of Thailand. Today’s adventure began with an adventure of its own. During the night a submerged line from a derelict mooring ball had wrapped itself around our rudder where it meets the hull. I saw part of the line trailing just behind the stern of the boat and tried to free it with the boat hook, but to no avail. This predicament presented the opportunity to dive under the boat with my new Spyderco nitrogen-hardened serrated-blade knife and slash away at the rope that had snared us. 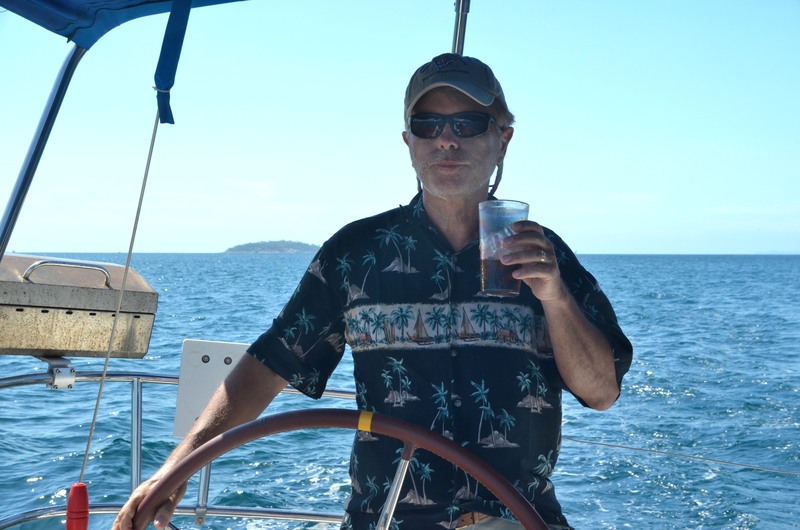 With mission accomplished we left Maya Bay and headed southeast toward Koh Lanta. Kantiang Bay on Koh Lanta is the home to a posh resort, Pimilai, where really-white white people stroll the beach–probably British or German. It’s also the home of the Why Not? Bar, an establishment more suitable to our station in life. The Thai food there was good, and the Bob Dylan and Cat Stevens songs were truly music to our ears. After dinner we talked to a young British accented woman named Phoebe who told us that her boyfriend’s wife died on Koh Phi Phi in the Tsunami. The social destruction of the tsunami seems to have extended beyond the physical damage because we have talked to several people who told us stories of friends and relatives lost in the disaster. They brought it up, not us. What a day! We started with Swedish massage by two Thai Muslim women at Surawee Massage. Then we rode through the jungle for an hour on an elephant named Natalie. After the ride we fed her big pieces of pineapple. I took a bite out of each piece before giving it to her–just to make sure that it was OK–and she waited patiently for her turn. She ate everything, even the bristley thing on top, but she was very gentle and careful. Back to the boat we weighed anchor and headed for Old Lanta Town to find a guy named Steve who might have some marine supplies we needed. Old Lanta is a true Thai town, mostly a fishing village with a long concrete pier for fishing boats and ferries–not a single resort in sight. As we dinghied toward the dock we heard music playing and saw banners flowing in the breeze and rows of white tents. We didn’t know it, but this was the final day of the Lanta Province Festival! What serendipity, and what a hoot! Vendors were selling a thousand kinds of food, from fried things that I can’t even guess what they were to gelato and coconut custard pie. We wandered through the maze of vendors and wound up in a large clearing with a stage and an enthusiastic announcer. Then serendipity struck again–two policemen came through clearing a path through the crowd and leaving us on the front row to watch a parade filing into the arena. The paraders were representatives of each town in the province. Each town group was led by two beautiful girls in ornate outfits carrying a banner that announced their town. After the girls came a group of young and old people from the town, many of them playing instruments or drums. After video recording enough of the parade, we set off to find Steve, the owner of Lanta Marine Services. We kept asking people where Lanta Marine Services was. Nobody could really tell us, but they said that a Frenchman named Bean (maybe they meant Ben) at the Mango House restaurant probably knew where to find Steve. We went there and Bean tried phoning Steve, but with no luck. Since Steve frequented the Mango House, we decided to eat a little. This accomplished not only eating, but also resting our feet, checking our email on the wifi, and waiting for the serendipity of the day to bring Steve around. Before we finished eating, Steve appeared and introduced himself. Yes, he had the parts we needed and would bring them to our boat in the morning. I have grumbled daily about the boat not being properly prepared for our charter, but if it had been, we would have never experienced the Lanta Festival, which would have been a real loss. We were also on a quest for ice. Steve connected us with a shop owner who sold us about 30-35 pounds of ice for 60 baht, about $2. We lugged it back to the dock where our dinghy was tied and discovered that the tide had risen and floated our dinghy away from the dock where I had tied it. How could we get into the dinghy without swimming in the dark water? Serendipity struck again! Three young Thai men were standing on the dock wondering how they could get to their boat which was even further from the dock than ours. So one of them climbed down a concrete post on the dock near our dinghy, jumped into the dinghy, and paddled it to where we could get in. Then we took him out to his boat and he went back to get his two friends. I tried to pay them for helping us but they absolutely refused. We have found all the Thai people to be friendly and generous with their help. An almost windless day made motoring the only good option, so we motored toward Ko Ngai. We stopped to snorkel at a tiny neighboring island, Ko Ma. 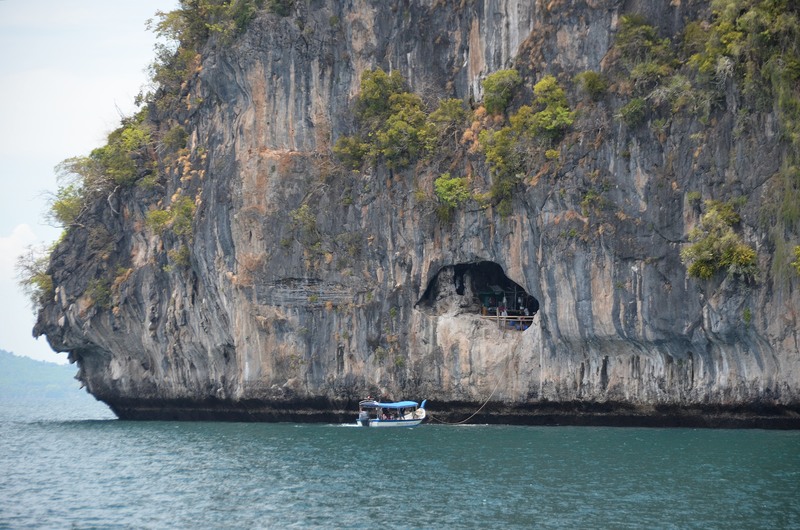 Our next stop was Koh Mook, an island that is best known for its Emerald Cave. Over dinner at a local restaurant we were surprised to hear a Willie Nelson duet about the silver eagle meeting the great speckled bird! Diana relaxed on Malee while I went with Princess Divers to Ko Kwuen for a couple of dives. The dive boat was a long-tail, the first I had ridden on. The floor of this rather crudely built boat was laid with one-inch thick teak planks that would be worth big money at an exotic woods retailer in the USA. The fish were super abundant including some beautifully colored ones that I had only seen in pictures before, but the sea fans and soft corals were even better. The soft corals came in a variety of delicate colors including pink, lavender, and frosted white. After lunch we moved Malee up the coast to a spot near Mot Muk cave, also known as the Emerald Cave. This cave is about 150-200 feet long and open to the ocean. At low tide we swam through it to a canyon with a beach inside the island! The light from the opening on the ocean side of the cave dwindled and vanished just before the light from the hidden canyon reached into the cave. By keeping going through the darkness we came into the light again. I think there is a sermon in there somewhere. The canyon was incredibly beautiful with towering tropical trees reaching up a hundred feet or more toward the top of the canyon. Heavy vines covered the sheer walls of the canyon, and a bird’s strange song echoed through it. As much as we enjoyed Ko Mook, it was time to move on. Ko Rok, a pair of islands 16 miles to the southwest, are uninhabited but have a beautiful channel between them. Coral heads in the shallow water made going ashore tricky, but they were great for snorkeling. At low tide I snorkeled over coral close enough to touch without diving at all. This coral field was a great fish metropolis with neighborhoods of yellow fish in one area, blue fish in another, and a few neighborhoods of mixed ethnicity. In the morning long-tails and speed boats shipped in snorkelers and sunbathers. By the afternoon the day boats had cleared out and we walked the beach alone. Some more snorkeling and a swim back to Malee concluded the day. We have learned that the wind blows early here, dies in the middle of the day and then blows again in the late afternoon. With an early start we estimated that we could reach the Ko Ha group of islands before the wind died. 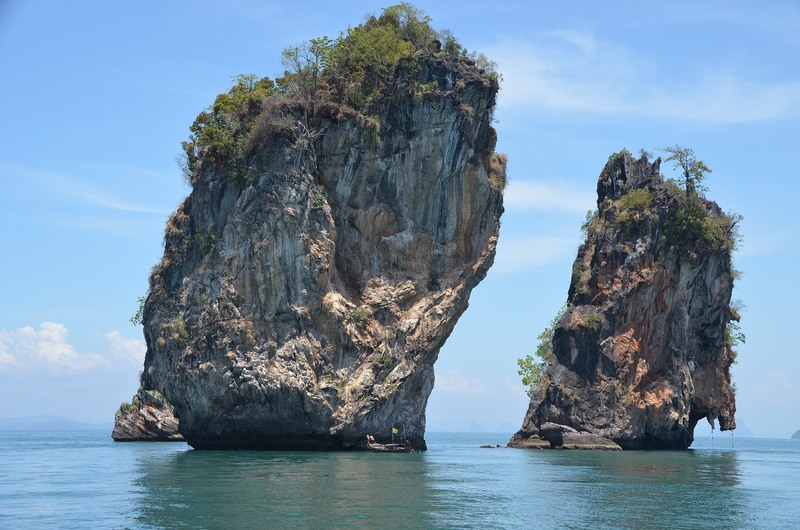 Koh Ha consists of five rocky outcroppings that rise up from deep water. Between the middle island and the two smallest islands is a bay of beautiful aquamarine water, an idyllic place to snorkel and spend a night. When we arrived we found the tiny bay crowded with huge dive boats including several live-aboards that were loaded with divers and tanks. There was only one mooring ball left so we cautiously headed toward it. Two dive boats began blowing their horns and three boats had people waving their arms shooing us away. I don’t know if they knew something about that ball that I didn’t know and needed to know or if they were just saving it for one of their own kind. As the only sailboat among a half dozen dive boats and two hundred divers, we felt definitely unwelcome. Since the water outside the bay was much too deep to anchor in, we chose a new destination. Just south of Ko Phi Phi Le are two small islands, Ko Bida Nai and Ko Bida Nok sitting on a shallow shelf, perfect for anchoring. 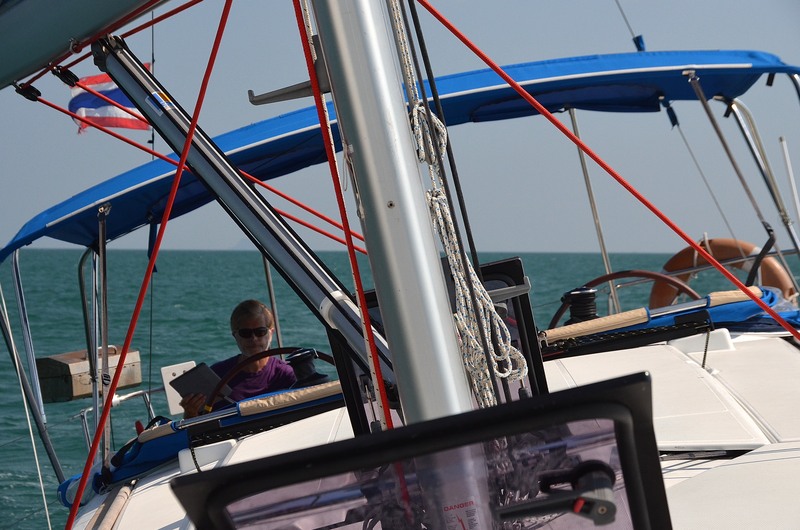 We motorsailed the 18 miles there only to find two more obstacles. First the shelf shown on the charts just didn’t exist.. The water was 90 feet deep, much too deep to anchor. One of the dive boats came toward us blowing its horn, and while I wanted to stay just to assert sailors’ rights to the anchorage, anchoring really wasn’t possible so we chose a new destination again: the familiar waters of Maya Bay on Ko Phi Phi Le, four miles north. Maya Bay was much more hospitable than Ko Ha and Ko Bida. We anchored in 20 meters, and enjoyed watching the last of the day boats leaving just before dark. We shared the large bay with only one other boat. We awoke to a mild northeast wind, just what we needed to sail a broad reach west to Ko Racha Yai, 26 nautical miles away. It felt great to be under sail power with no engine noise to intrude on the solitude of the sea. The splashing sounds of water against the hull and the occasional creaking of the boom were great sailing music. The wind died before we reached Ko Racha, but it had carried us most of the way. We motioned to the bullpen and brought in the engine to pitch the final inning. We closed out the game by dropping the hook in 10 meters of water in Bungalow Bay by the 5-star Racha Resort. After snorkeling along the rock shore near Malee, we cleaned up and went ashore to have a meal like proper folks. That meant a shower, hair combed, and a shirt with a collar for me and a sporty dress for Diana. The restaurant at The Racha Resort had live music from a Filipino trio, a lovely view of the bay at night, free wifi, and baby back ribs that no self-respecting Kentuckian would serve to a guest. The wind and seas were up so we sailed a strong beam reach south to Ko Racha Nok, two almost connected uninhabited islands with a reputation for great snorkeling and diving. We saw the biggest seas of the trip, still only 4 feet, and the strongest winds, around 19-20 knots, so the sailing was exhilarating. Snorkeling was a different matter. 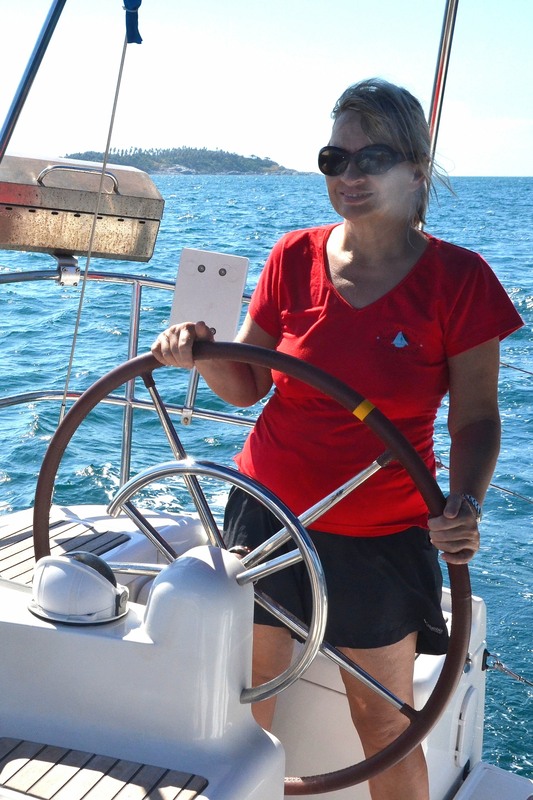 The seas were so deep around Ko Racha Nok that anchoring was impossible without getting too close to the rock shore. The wind and seas were still favorable so we made great time in the passage to Ao Patong, a very large bay and tourist city on the Andaman Sea coast of Phuket. This city, Ban Patong, was directly exposed to the 2004 Tsunami and sustained extensive damage, but the reconstruction was meticulous. Every dingy little side street and alley was restored to its previous condition. Every garish t-shirt shop and pirate video kiosk was rebuilt. Every ugly utility line was strung through the air just as before. It was just like the tsunami never happened, except for a memorial on the main street and the tsunami evacuation route signs. 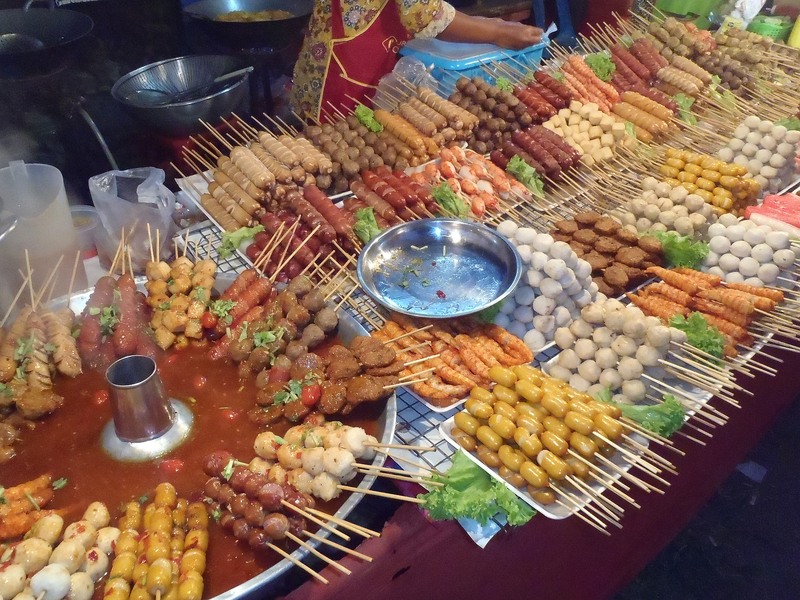 The beauty and glamor of Ban Patong didn’t stop us from hitting the tourist trail. We bought a fake Ralph Lauren shirt for me, a dress for Diana, and a few gifts for friends at home, but our real mission was the Quest for Nam Keng (also known as looking for ice). Our most precious purchase was 13 small bags of ice. 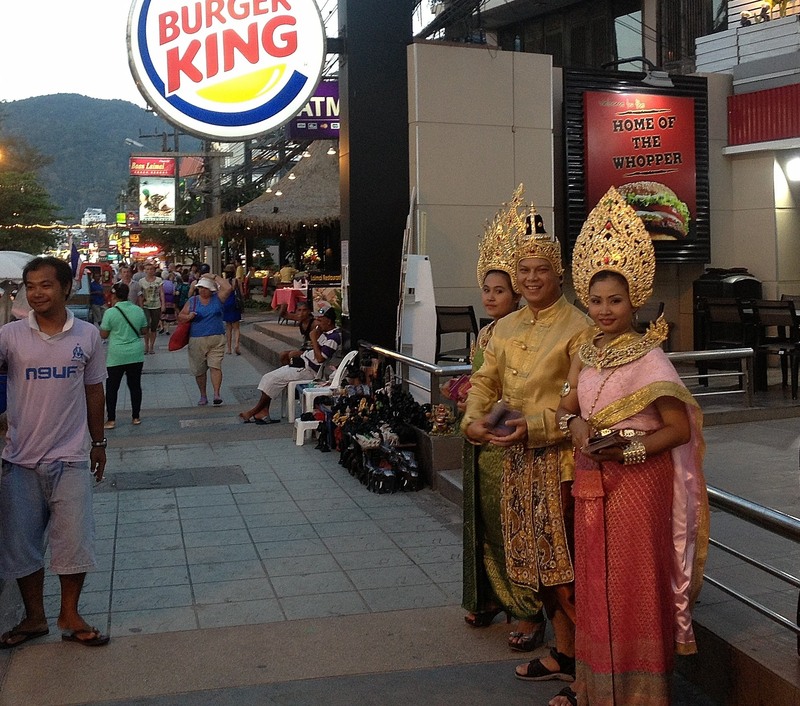 Although we had never been there before, Ao Patong had a familiar feeling. 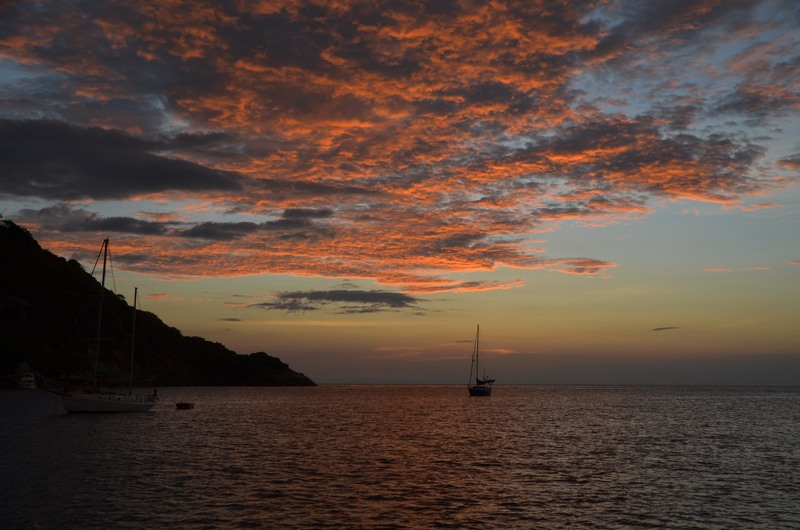 The bay itself felt like Charlotte Amalie harbor in St. Thomas–large and round in shape and shallow enough for easy anchorage. The beach felt like Rio de Janeiro–a long broad expanse of sand covered with sunbathers who needed to be covered with something. Beach activities felt like Daytona –parasailing and jet skiing gone wild. And the city itself–just name your favorite tourist trap. Heading south, we rounded the tip of Phuket island and turned northeast toward the Ko Khai islands, a group of six small islands about halfway between Ko Phuket and Ko Yao Yai. Ko Khai Nok, the largest island, could be called the Island of One Thousand Umbrellas for the massive spread of beach umbrellas across its sand. Under the umbrellas two thousand beach chairs provided temporary refuge from the sun for the hundreds of tourists brought to the island by a fleet of fine speed boats. The tourists were mostly Europeans and Japanese. It was easy to tell which were which–the Europeans wore bikinis and Speedos, while the Japanese wore life jackets. After investigating this phenomenon, we retreated by dinghy to Malee which was moored near a tiny rocky island in this group, Ko Khai Nui. We chose this island because it was away from the commercial craziness of Ko Khai Nok and because of the Chok Dee restaurant perched on stilts there. This restaurant came highly recommended for its Thai food. Unfortunately the recommendation failed to mention that Monday is the cook’s day off. 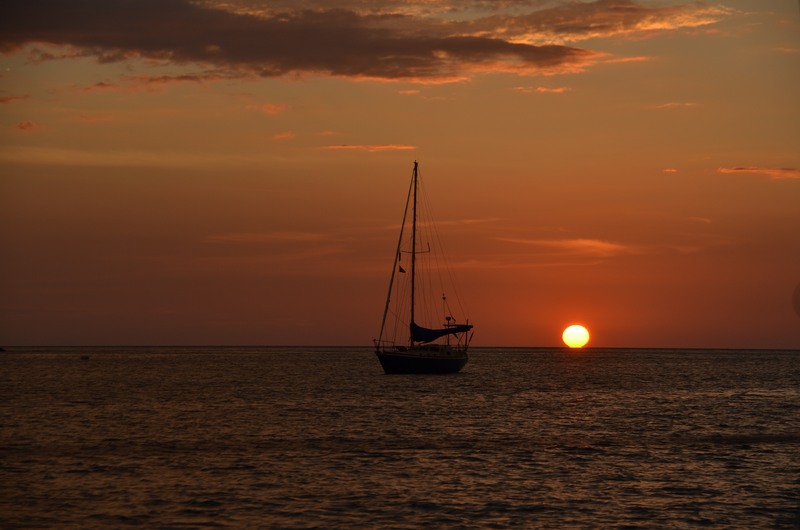 As night began to fall several long-tail boats became our neighbors on nearby mooring balls. Our sophisticated, spacious, and comfortable boat provided a stark contrast to the simple long-tails. They were live-aboard boats for fishermen known as “sea gypsies.” By day they were working boats, and by night they were lodging. Each had a small covered area which contained the essentials of life. We saw a family of four eating dinner after dark on the long-tail next to us. In addition to the soft white light over their table, the front of their boat was flashing red, green, and white lights like a panic-stricken Christmas tree. I suppose this is so other boats will see them and not run over them in the dark. I was impressed with their intimacy with the sea, but not attracted to their life. To reverse George Gobel’s famous phrase, we felt like a tuxedo in a room full of brown suits. We began our day by snorkeling over the coral between Malee and Chok Dee. The fish were an enthusiastic welcoming committee swimming up to us literally in hundreds. Black and yellow striped fish, green and orange fish, angel fish, yellow tangs, butterfly fish, trumpet fish. They not only swam near us, they swam up in our face to study us through our snorkel masks and they accompanied us as we swam around the area. Thai fish are very friendly, especially if they think you might feed them. It was almost 11:00 a.m. by the time we finished snorkeling and cleaned up, so that meant lunch at Chok Dee. We dinghied up to the restaurant and one of the staff waded out to meet us and pull our dinghy up to the steps. After we got out he took our dinghy and tied it to the dinghy line in front of the restaurant. Our meals were beautifully presented and delicious–New Zealand mussels with garlic sauce and salmon with dill sauce. When we were ready to leave we got into their dinghy and a staff person took us out to our dinghy. Valet dinghy service at tiny Ko Khai Nui! While sailing north to our next anchorage at Ko Phanak we passed by several lovely pink and lavender jelly fish about the size of pumpkins. We could see them pulsating slowly in the water but we were too mesmerized to think to take photos. Ko Phanak is the southernmost island in the fairy wonderland of Phang Nga Bay. Dozens of relatively small islands have the most fantastic shapes–witches’ hats, Mohawk haircuts, stegosaurus ridges, mushrooms, fingers, vases, camel humps, and other improbable geological formations with ghost islands lurking in the background.. These shapes defy depth perception so you are never sure if there are passages through the islands, but when you get closer you find them. We entered into a rather large canyon with walls that went straight up about 200 feet. Trees and bushes and grasses grew on the canyon walls and the lake inside the canyon was very shallow at low tide. 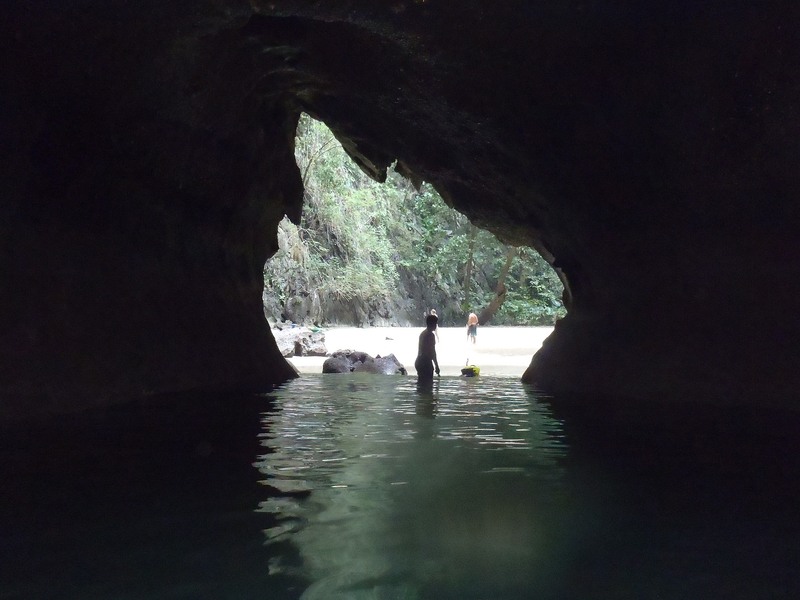 Although going through the Bat Cave was quite an adventure, the canyon seemed fairly unremarkable until we saw a troupe of monkeys sitting on a large rock that came down to the water. There were six adults, four adolescents, and two babies. 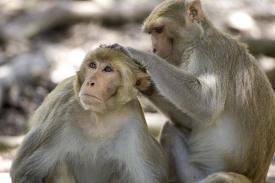 We watched in silence as they went about their morning grooming exercises at the monkey salon. They picked through the fur of the monkey on their left, then they reversed and picked on the right. The babies crawled onto their mothers then they scampered off a little distance to play. Over on the other side of the lake a large monkey dove into the water and swan underwater for at least twenty feet before he came up. I don’t know if he was fishing or practicing for the Monkey Olympics. Maybe he was just swimming for fun. Later on three monkeys climbed a rock and cannon balled into the water from about ten feet up. Diving must be a Monkey Olympics event. It was clear that the monkeys were doing this just for the fun of it because they had to go out of their way to climb the rock. The monkeys seemed completely unconcerned about us although the breeze inside the canyon had blown our dinghy close to them. One monkey took interest in us and waded out through the shallow water to look at us. He came to about ten feet from our dinghy and just pondered us for a while. I wasn’t sure of his intentions so I watched him watching us but I had my hand on my oar in case this encounter went sideways. There seemed to be two families of monkeys, the Eastbanks and the Westbanks. After the Eastbanks had closed their grooming salon the Westbanks got into a ruckus. I think the fuss started when one monkey was monkeying with another monkey’s monkey. The rest of the day was anticlimactic after our Jane Goodall experience with the monkeys. We sailed to Ko Hong, which as the name suggests, is almost all hong. The entrance was easy, but no primates here, except for the tourists in sea kayaks. Then we sailed on to an island which is known as James Bond Island because of its use in the 1974 James Bond movie, “The Man with the Golden Gun.” The rock formation there was especially impressive–a stone monolith rising straight up from the water but smaller at the bottom than at the top. We bought a few souvenirs from some sweet Thai ladies, one of whom had sold souvenirs on this island for 20 years. They asked about our families and we learned about theirs. We had to sail south to get around a large shallow area in Phang Nga Bay, so we sailed back to Ko Phanak where we had seen the monkeys. We went back to the cave at the same time as yesterday, but our monkeys weren’t there. That was disappointing but because the tide was a little higher today, we were able to row into a second part of the hong that we couldn’t get into before. Fun, but still not as much fun as a barrel of monkeys. 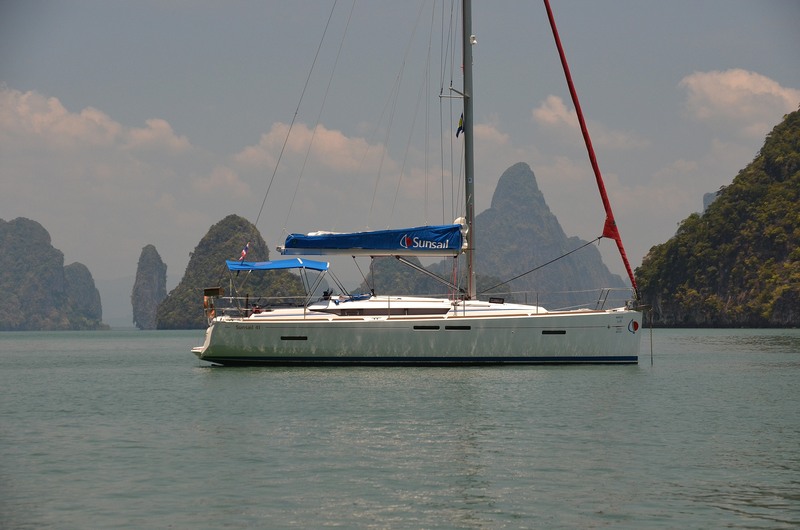 We sailed a crooked course from Ko Phanak to the east side of Phang Nga Bay in order to avoid shallow spots. At one point the water was barely deeper than Malee’s keel, but we held our breath and picked up our feet and made it through to deeper water. Just before dark we anchored near the Ko Yao Noi Resort. We were ready for some solid land and some solid food, and we weren’t disappointed. The resort was casually elegant. The meal was delicious and the service typically Thai gracious. The resort had an outdoor movie screen and was showing–guess what–“The Man with the Golden Gun.” We could see the screen from our table and could hear the movie so we watched part of it. The action was hokey and the repartee was embarrassingly campy. How did we ever think this was glamorous? But when the James Bond theme music came up it evoked the same sense of allure, romance, intrigue and excitement that it did in 1974. The Quest for Nam Keng Trilogy entered its final phase with a trip in the back of a pickup truck taxi into the village on Ko Yai Noi. You might be in Thailand if the big supermarket in the principal town of a large island is a 7-11. It had several items we needed but no ice, meat, fruit, or fresh vegetables. Those items required going to several specialty grocers. By asking at a few shops as we worked through our grocery scavenger hunt, we learned that the shop next to the Fresh Mart had ice. We filled our insulated bag with several bags of hard frozen ice and happily climbed into the taxi for the fifteen-minute ride back to the resort where our dinghy was tied to a palm tree on the beach. 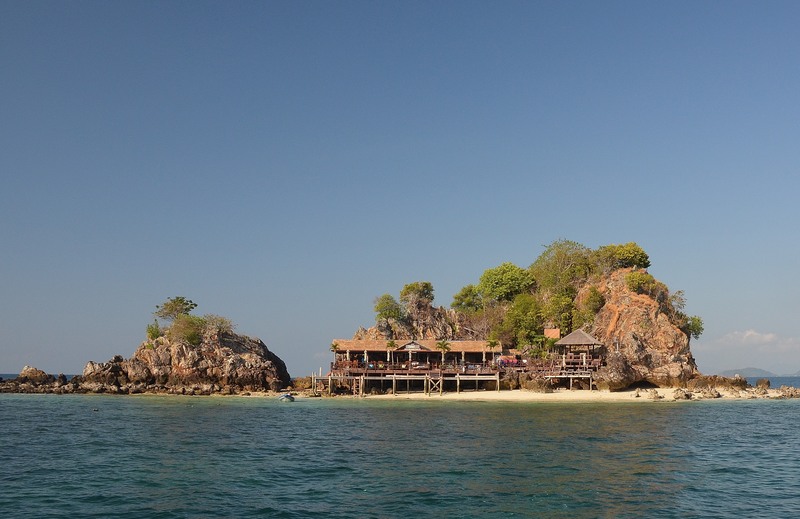 We sailed south to weave our way through the Ko Ka group of small but towering islands. High on the smooth side of one of them was a cave opening where a bird nest collector had set up camp. He will live there for months guarding the bird nests that are highly prized in China for bird’s nest soup. When he harvests and sells them he will earn his year’s income for living like a hermit. Next stop was Ko Hong Krabi, similar to Koh Hong except located in the Krabi district. It had a the largest hong we have seen, probably 800 feet in diameter, and we didn’t have to swim through a cave to see it. It had a narrow passage that connected to the sea so we entered it in the dinghy. It had beaches inside it including one long strip of sand in the middle of the hong. Inside the hong birds sang and starfish crawled slowly along the bottom. We hated to leave but we had miles to go before we slept. We passed the King of Thailand’s summer palace on the way to our anchorage at Rai Le Bay. Rai Le was just as described to us, a small Rio de Janeiro. It had its own Sugar Loaf, but no Corcovado. Its long beach was not so glamorous as the real Rio’s, but unlike Rio, it faces west and allowed us to enjoy the most glorious sunset we have seen. Sashes of fire draped through the cobalt blue sky and became richer and redder as each minute passed. When night arrived the shore came alive with lights from restaurants and the swirling glow of a fire dancer. Soft samba music floated across the bay and made us wonder if perhaps we really were in Rio. We got an early start while the wind was good and sailed to the twin islands Ko Dam Hok and Ko Dam Khwan. Both islands have good beaches but their most interesting feature is a sand bar that connects the two. At low tide you can walk on sand from one island to the other, about 1100 feet apart, but we arrived at high tide. All the better for the challenge. We went ashore on one island in the dinghy and then waded across to the other island. The water was never over my head but I had to tow Diana part of the way across. We were almost alone on the beach but that didn’t last long as speed boats and long tails began arriving. That was our signal to leave so we waded back across the sand bar, dragged the dinghy off the beach, and motored back to Malee. 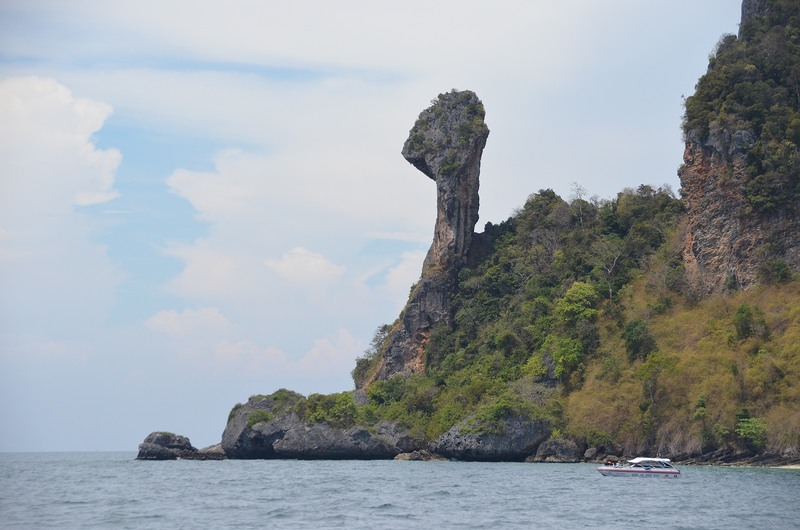 We rounded Chicken Head, an odd shaped rock tower on the tip of the island–which got its name for a reason that you can easily guess–and then settled into a long broad reach to the southern tip of Ko Yao Yai. Rounding Ko Yao Yai we set a course for the restaurant-on-a-rock that we discovered last week, Chok Dee Restaurant on Ko Khai Nui. Unlike our first visit, it was busy with a party of about twenty people including adults and children. We met the ambassador from Panama and Peter, the owner, and enjoyed a good Thai meal in a relaxing atmosphere. This little rock could be our home away from home in Thailand. It’s our last day onboard Malee. We set sail toward Ao Po Marina today with mixed feelings–sorry to leave Thailand because there is so much more to see, eager to get home where we have air conditioning (although we probably won’t need it), dreading packing all our equipment into luggage not exceeding 50 pounds each, eager to catch up on news and everything happening at home, reluctant to face the 28 hour flight home, but eager to see family and friends again. We stopped to snorkel at Ko Sup, the “bunny ears” islands we passed on our second day. They rise 35 meters straight up from the sea, so we assumed that the water around them would be fairly shallow and good for snorkeling. Wrong–20 meters deep, much too deep to see anything except the minnow sized fish that swim at the top. But even a dud adventure can turn out well. While we were anchored there eating lunch, a long-tail fishing boat approached us. It was the same man and woman who sold us a batch of prawns when we passed here before. This time they had tiger prawns. They are like lobsters without claws. So our fishing friends made a sale and we had tiger prawn dinner–yum yum! This is a good life, living off the sea!